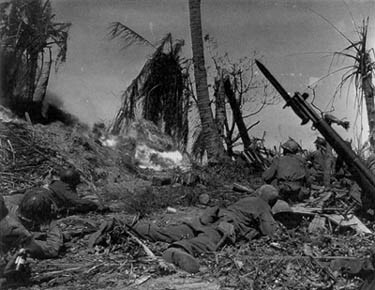 The Battle of Kwajalein was a battle of the Pacific campaign of World War II, fought from January 31, 1944, to February 3, 1944, on Kwajalein Atoll in the Marshall Islands. Employing the hard-learned lessons of the battle of Tarawa, the United States launched a successful twin assault on the main islands of Kwajalein in the south and Roi-Namur in the north. The Japanese defenders put up a stiff resistance though outnumbered and under-prepared. 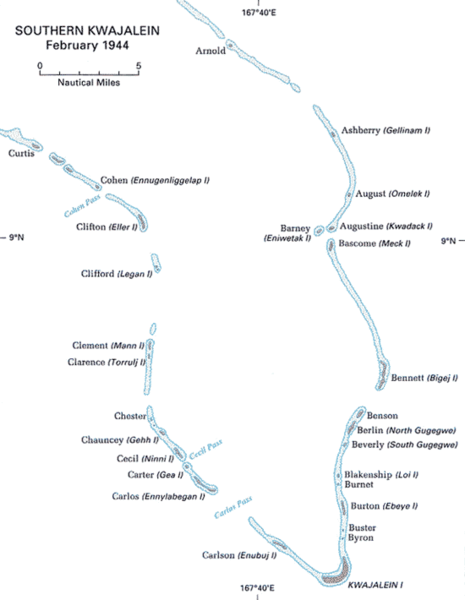 The determined defense of Roi-Namur left only 51 survivors of an original garrison of 3,500. 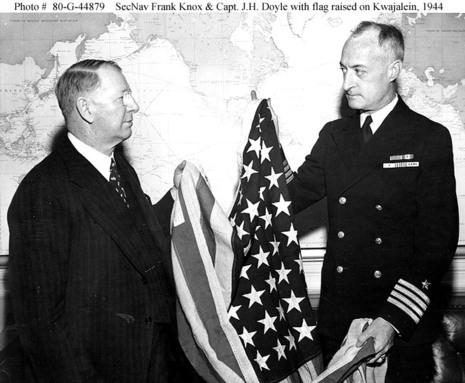 For the United States, the battle represented both the next step in its island-hopping march to Japan and a significant moral victory because it was the first time the United States penetrated the "outer ring" of the Japanese Pacific sphere. For the Japanese, the battle represented the failure of the beach-line defense. Japanese defenses became prepared in depth, and the battles of Peleliu, Guam, and the Marianas proved far more costly to the United States. In the wake of the US victory at Tarawa in November 1943, Allied forces continued their "island-hopping" campaign by moving against Japanese positions in Marshall Islands. Part of the "Eastern Mandates," the Marshalls were originally a German possession and were awarded to Japan after World War I.